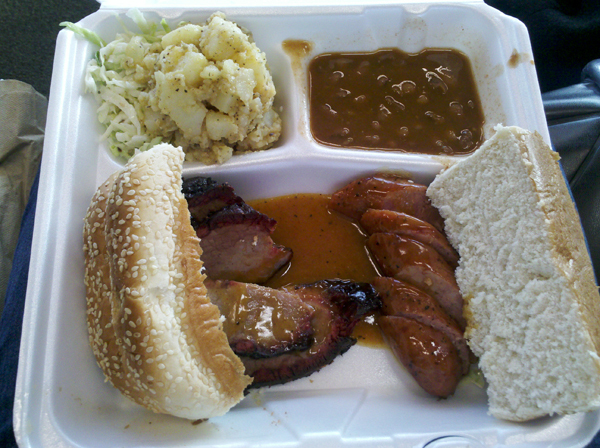 In some of my "research" before I headed off to Austin, I saw that people were claiming that The Salt Lick was one of the places a visitor must eat at if going to Austin. Because of the way activities were set up during my trip though, I didn't get a chance to go there. However, I noticed that there was an off-shoot in the airport so while waiting for my flight back, I decided to snag myself a platter. I think a combination of the place being in an airport and my high expectations (not at all dissuaded by the giant banner claiming it to be one of the top 100 restaurants according to the Travel Channel) made my brisket and sausage platter fall flat in taste. I mean, the brisket was actually pretty good but the sausage was nearly bland and the sauce didn't pair well with the sausage. I liked the slaw because the black sesame seeds were a fine touch. The potato salad was pretty good too but close to being flavorless, and the beans were just flat out disappointing. I didn't even eat more than a taste of the beans. I know that airport food is always expensive but I didn't feel like the platter was worth the $12 I dropped on it. Maybe next time I visit, I'll try to see what the actual brick-and-mortar restaurant is like. 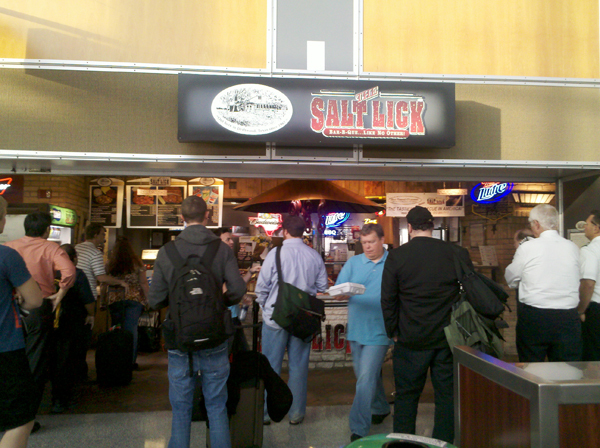 The Salt Lick location at the airport is not a good barometer of the real thing. Try the real location in Driftwood, it is amazing. Yeah that's what I figured. I mean, I did understand that it was in an airport but it barely "hit the spot" if at all. I'm hoping to check out the actual location whenever I get back in town/state.